*****ALSO! NEED MORE ROOM?? OUR SECOND BEACH HOME (THE GREAT SEAHORSE) IS A 3 BR / 2 BA BEACH HOUSE ONLY ONE MILE EAST! WE HAVE GROUPS TAKE BOTH HOMES WHEN THEY NEED TO ACCOMMODATE MORE PEOPLE! THE GREAT SEAHORSE IS FEATURED AT WWW.VRBO.COM/263366. 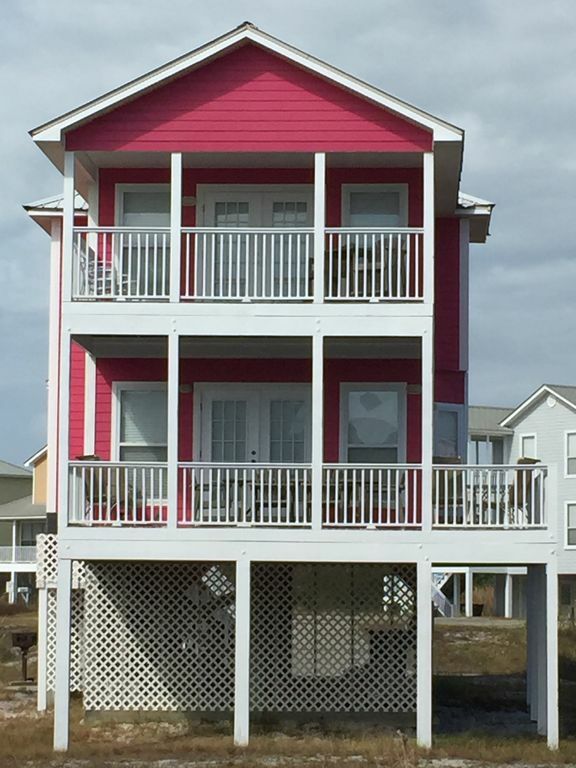 THE FLAMINGO is the perfect beach house for a week long family vacation or just a weekend getaway! Situated on the Fort Morgan peninsula on the Gulf of Mexico in Gulf Shores, AL, the GREAT FLAMINGO property offers all of the amenities needed in a great beach community, including two pools, (NOT HEATED AND NO WHEELCHAIR ACCESS AT THE POOLS), tennis courts, and private beach access. There is WHEELCHAIR ACCESS to the entire first floor and deck. The Flamingo is the ultimate beach house for that perfect, well-deserved relaxing vacation! We provide free high-speed WI-FI internet via our cable modem and wireless router. Our new 50' plasma, HD TV is great for all of your favorite movies or TV viewing. Two large and long sofas just placed at the house for your comfort! ***KID SAFE LOCATION AS OUR BEACH HOME IS IN A CUL-DE-SAC RIGHT NEXT TO POOL AND BEACH SIDE! The Flamingo is poolside (see picture from the deck, about 25 steps away!) and is located in the private beach community of Morgantown and has two pools, two lighted tennis courts, and private beach access. You can keep an eye on the kids in the pool while you enjoy the views from our covered deck. What convenience! We are located in the private beach community of Morgantown, which is an upscale, clean, and family-friendly neighborhood. The Flamingo sits beachside with visibility of the Gulf of Mexico and beautiful sunsets. It is just a short walk to the beautiful sandy beaches of the Gulf of Mexico. This fully-equipped beach house has everything you need, so just bring your swimsuit, beach towels, and beach chairs! The first floor is completely wheelchair accessible, including master bedroom, bathroom with roll-in shower, kitchen, and deck that overlooks the pool and a view of the Gulf of Mexico. The Flamingo has an outdoor shower available to rinse off sand and also an outdoor picnic table. 15 Golf Courses in the area! Fort Morgan Marina is five minutes away offering daily fishing charters. Gulf Shores fishing is known for beautiful Red Snapper and huge Grouper! Also, we recommend you leaving your worries and stresses of work behind, but if it is a must you can stay connected by using our free broadband Wi-Fi Internet connection. Just bring your laptop computer. Come and enjoy your vacation and see for yourself all the amenities, fun, and relaxation The Flamingo has to offer! This 3 bedroom and 2.25 bath fully furnished beach home has been the destination of choice for many beach seekers over the past several years. We have many repeat guests every year with some coming in for months at a time. We feel that this is the ultimate compliment! We think that you will not find a better value anywhere in Gulf Shores. Our private beach access, pool and tennis, the shopping, the golfing, Civil War Fort Morgan-Alabama State Historic Site, the museums, the fishing, the restaurants, the concerts, the beaches, the Mobile Bay Ferry, the sunsets, and the National Shrimp Festival are all awaiting you! Our location is perfect. We are located in the private beach community of Morgantown right on the Fort Morgan peninsula. The Flamingo is Gulf side and is walking distance down (about three minutes on our private boardwalk) to the sugar white beaches! We are far enough away from the hustle and bustle of downtown Gulf Shores yet only a 15 minute drive into town. You get the R&R that you deserve but can still access all that Gulf Shores and Orange Beach has to offer. Looking to decompress? You can sleep in late here, throw a steak on the grill, and then take a walk on the beach. It's only a three minute walk down to our private beach access on the boardwalk or you can drive it in 15 seconds and park at the beach. That's what we normally do since we can load up our beach supplies and just park at the beach. No loud music and crowds here in our private beach community. Looking to party or celebrate? Take your choice of all the attractions in Gulf Shores and nearby Orange Beach. Need to stay connected? An internet Wi-Fi connection is here. The National Shrimp Festival is must see and do event! Many love to visit the world famous Flora-Bama bar. Don't forget the annual Mullet Toss! Need a slot machine or blackjack fix? Biloxi, MS is just down I-10. No less than six Vegas style casinos are available. Need a history lesson? Fort Morgan and the Fort Morgan Museum is just five minutes away. It's the Civil War Fort famous for 'Damn the torpedoes, full speed ahead!' Need to get 'gone fishing?' Fort Morgan Marina is only about five minutes away and have daily charters. The Fort Morgan Pier is a public fishing pier as well and it's only about five minutes away. It's a great place to take the kids and watch the boats unload their catch. Let us know if you have any special requirements and we'll do our best to accommodate you. The Flamingo has been in the family now for about nine years and we try to go the extra mile for our guests! We take pride in treating our guests just like we like to be treated when away on vacation ourselves. We believe in 'The Golden Rule'. Beach chairs, beach umbrella, beach towels, (towels and linens for the house are provided), ice, charcoal, charcoal lighter fluid, grill brush, coolers, sunscreen, shampoo, a good book, DVD/VCR movies, golf clubs. GOLF-GOLF-GOLF!! There must be at least 15 golf courses within 30 minutes away and two are within 10 minutes away! The World Famous Kiva Dunes Golf Course (Voted #1 course in Alabama and Jerry Pate developed) is only ONE MILE away! You gotta play Kiva Dunes! BIRD LOVERS: The Alabama Birding Coastal Trail has a stop in Fort Morgan. CIVIL WAR and HISTORY BUFFS: The Mobile Bay Civil War Trail. Fort Morgan State Park. 'Damn the torpedoes. Full speed ahead!' You can almost hear the command of Admiral David Farragut as he led his troops into the battle of Mobile Bay. Today Fort Morgan is a testament to the evolution of American coast defense fortifications from 1834 to World War II. It's a history lesson waiting to be explored. Some regard it as 'one of the finest examples of military architecture in the New World'. Fort Morgan was designated a National Historic Landmark in 1960. In 2007 it was listed as 'one of the nation's 10 most endangered battle sites' by the Civil War Preservation Trust in History Under Siege: A Guide to America's Most Endangered Civil War Battlefields. Just 6 miles away! Then take the Mobile Bay Ferry over to see anther Civil War site, Fort Gaines. We think that this part of the Gulf of Mexico is 'the last frontier' in that it has not been commercialized like Panama City, Destin, Pensacola, and even Orange Beach and Gulf Shores to an extent. You really feel like you are on your own private peninsula here! As one member of my family stated when we purchased our first property here, 'Let's move here!'. The Flamingo is in a cul-de-sac in the private beach community of Morgantown. This offers a VERY safe environment for children and the elderly. It is RIGHT NEXT to the pool and is beach side. You get the best of both worlds at the Flamingo, POOL and BEACH! There is a zero-level and ramped entrance into the Flamingo that allows easy access for wheelchairs and those that can't handle steps very well. The Mobile Bay Ferry takes you over to Dauphin Island where you can then visit Fort Gaines, USS Alabama, and all of Mobile, AL. Biloxi, MS (Las Vegas of the South!) is just east of Mobile via I-10. Covered picnic table area under the house along with beach rinse-off shower area. Fort Morgan Museum and Civil War History just a few miles down the peninsula. Very private and family oriented beach community. Perfect environment for stargazers in that there are no city lights around. You can see stars for days! This is one of my personal reasons why I love this location! Fort Morgan Marina is five minutes away and has daily deep sea fishing charters. Come and watch the fleet unload their catch. Tacky Jacks is there too. Great food! toilet, shower, Fully handicap accessible with zero-level entry into shower. toilet, combination tub/shower, This is a jack & jill set-up. Two private vanities upstairs. Our downstairs full bathroom is also fully wheelchair accessible. Roll-in shower and hand rails in the shower and by the toilet. Partial view of the Gulf of Mexico! A/C of course and ceiling fans in all rooms. LOTS of room to park vehicles. Probably eight or so can park easily. FREE Wi-Fi via cable modem. Towels provided for house use BUT BRING YOUR BEACH TOWELS! FREE internet access via cable modem! Ramped entrance for full wheelchair entrance and wheelchair access on the first floor! First floor features accessible bathroom, roll-in shower, master BR, roll-out deck, living room, and kitchen. Leather sofas and 50' Plasma HD TV. With built in ice maker. Coffee maker, blender, can opener, etc. provided. Dining table seats six and an additional four stools at the bar area. This is all in the dining area. We have digital cable TV so no problems when weather becomes cloudy! Overlooks the pool and partial view of the Gulf! Looks great at night!! Both decks overlook the pool! We have an outdoor picnic table under the house too. It's near the outdoor rinse off shower area. Golf is all over this area! Probably a dozen courses here! Kiva Dunes probably the most talked about and acclaimed. The first floor is handicap and wheelchair accessible. We have a ramp that provides access for a wheelchair to enter the house. The first floor has a bedroom with king bed, kitchen, bathroom with roll-in shower, living area, and outdoor deck overlooking the pool with a partial Gulf of Mexico view. Everything on this level is handicap and wheelchair accessible. Call if you need any further details. (2) Pools NOT HEATED & are only 25 steps away from the house. NO WHEELCHAIR ACCESS AT POOLS. Men & women bathrooms at the pool. Our 2 decks overlook the pool. What a view! New second pool is now open! Bring all of your beach gear as we don't provide any. Great beach, good restaurants, would not recommend the beach house. I notified Derik of the following problems and he said he wanted to talk to me three weeks ago but I haven’t heard back from him. He said he could have fixed all the problems, including the mattresses, if I had called him the first day we were there. We didn’t know how nasty they were till we removed the bedding on the day we were leaving. The house was very dirty. Our feet were black from walking on the floors. The upstairs balcony light is out. The master bedroom door scrubs against the floor. Upstairs door handle doesn’t work. I sent Derik pictures of the dirt, mold, mildew and spider webs. The pillows are filthy and unsanitary as are the mattresses with urine stains. There was sand in the downstairs bathroom when we arrived. There was mold on the shower curtain upstairs, and what appears to be mold on the wall and in the crease of one of the doors along the hinges. Also, hair and dirt in the shower. The house was not cleaned and the guests are paying for it to be clean. The air conditioner quit working every evening. We had to call Derik everyday and tell him it wasn’t working. I think he controlled the unit because no repairman ever came. The ac would come back on about 10 minutes after calling him. We had a wonderful time at The Flamingo. Pros~ great location, clean , walk to the beach. Cons~ the downstairs never got cooler than 76 even though we left the stat on 71(owner said do not turn below 71 or it would freeze). The wifi didn't work. The outlets at the kitchen bar did not work and in one of the bedrooms. The cable was out when we got there but the owner contact the company and we had tv the next day. Over all we had a wonderful time :) The owner is very fast responding to text. Location is wonderful. Not fancy but all the basic necessities are provided. Thanks for your review Traci although we are disappointed with the three (3) star rating. This is only the second time in 55 reviews encompassing more than ten years that we've had a rating below four (4) stars. The new grill is on order and a temporary replacement was on property for use. Extra forks were available in the owner's closet for your use as well. This is why it's key to communicate with the owner to discuss anything that you might need while on property. I checked with Traci during her stay and afterwards and she stated everything was just fine. We strive to ensure that everything is exactly as you expect and to provide all needed items. For future reference PLEASE call us if you are in need of anything at all as instructed in your check-in information. We hope you choose us again in the near future. Thanks again! Very comfortable house near the beach. We had a lovely vacation/Spring Break with family and friends in Flamingo House. Derrick (the owner) was very attentive and responsive whenever we needed anything. The only reason I gave this property 4 stars instead of 5 is because there was a tenant before us who caused a lot of damage and the owner did not had enough time to make all of the necessary repairs. We would go back! Fort Morgan is the perfect family vacation beach! Thanks for your kind words! Please visit us again soon! This is our third time to stay at the Flamingo. We love it. Our adult son is in a power wheelchair so finding an accessible house is a problem, but the Flamingo is great. Easy access and the open floor plan gives him plenty of maneuvering room. We have two small dogs so finding a house that is wheelchair accessible and pet-friendly is definitely a plus. We also rent a power beach chair from Power Beach Rentals and the access to the beach works great for the chair. The house is always clean and well equipped. Derrick always answers promptly and is very helpful. The house was just as advertised, very comfortable, the beds were good. Short walk to a great beach. The owner was extremely helpful over the phone. We did not meet the owner in person, no one bothered us while we were at the property. We booked the house on short notice to escape South Florida with the onset of Hurricane Irma. The owner was willing to extend our stay to help us out. The people we encountered in Morgan's Point and Gulf Shores were some of the nicest people I've ever met while traveling. I would book the property again without question. Five minutes from Fort Morgan State Park (Civil War Fort famous for 'Damn the torpedoes, full speed ahead! '), also five minutes from full service Fort Morgan Marina and the Mobile Bay Ferry (check schedule online) which takes you over to Dauphin Island and Fort Gaines. Full gaming casinos are 75 miles away (via the ferry) in Biloxi, MS. Major airports are 90 minutes away in Mobile, AL and Pensacola, FL. Jack Edwards airport in Gulf Shores, AL accommodates non-commercial flights. The National Shrimp Festival is held in Gulf Shores every year. Fall time is BY FAR the BEST time to visit! Gorgeous sunsets and the weather is perfect. No crowds, no traffic, no problems!! MANDATORY PRIOR APPROVAL FOR PETS. 5% CREDIT CARD FEE. $200 REFUNDABLE DAMAGE DEPOSIT. 5% LODGING TAX. UTILIZE eCHECK TO AVOID THIS FEE! :) $150 CLEANING FEE. RATES ARE MORE FOR MAJOR HOLIDAYS. PLEASE INQUIRE.